Cultural differences and similarities both come to light – in the middle of a city, Los Angeles, that is home to more than two hundred languages. The Comparative Literature program offer a major and minor as well as a Departmental Honors Program for those who wish to further enhance their training in the field. UCLA is passionately committed to issues of diversity and an inclusive environment for everyone on campus. In that spirit, Comparative Literature is a discipline that mirrors some core beliefs of the university regarding diversity. For example: “We value differences as well as commonalities and promote respect in personal interactions.” Or, elsewhere: “We are committed to ensuring freedom of expression and dialogue, in a respectful and civil manner, on the spectrum of views held by our varied and diverse campus communities.” Comparative Literature concerns itself with diverse literatures and cultures worldwide, both in harmony and conflict with one another. In a word, the UCLA Department of Comparative Literature guarantees an introduction to storytelling in transnational or global settings, such that individual study and research together interweave with other disciplines – far beyond the Humanities. Not only do students have access to the University of California Education Abroad Program (UCEAP), with opportunities in 42 countries, the department also encourages students to incorporate study abroad into their academic programs. This builds an expertise that works directly towards an equally wide choice of careers. Comparative Literature, more than any other degree, allows students an opportunity to understand the beliefs and values of multiple cultures– as they interact in an increasingly networked world. UCLA is home to a cutting-edge Career Center, so that students may link their studies to a future workplace in a timely and confident manner. Comparative Literature offers expertise in the traditions of many past cultures, together with an ability to engage with them in the future. 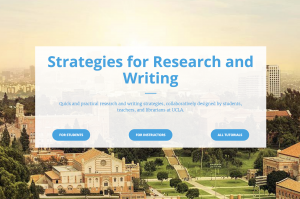 WI+RE (Writing Instruction + Research Education) is a UCLA community focused on helping all learners succeed in their writing and research projects. We support the research and learning mission of the university by providing online access to a systematic foundation of research, writing and information literacy skills. As learners ourselves, we stay current on shifts in the information landscape, and create and provide opportunities for learners to get involved with a variety of methods and technologies used in research and research production, especially through the instructional process/learning process. Our resources are designed to empower learners with practical skills and information necessary to excel at UCLA and beyond. The Department of Comparative Literature is part of the Humanities Division within UCLA College.